PMM mysql relication monitoing not working for multisource replication. 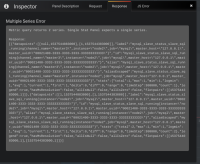 PMM MySQL Replication dashboard error "Multiple Series Error" forthe host with multi-source replication. This cause the error: Metric query returns 2 series. Single Stat Panel expects a single series.